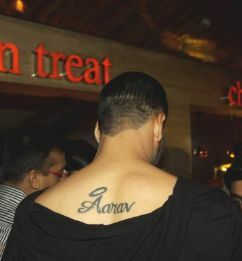 Akshay has his son’s name “Aarav” inked in cursives on his back, which shows a strong father-son bond. Akshay got his wife’s nickname “Tina” inked on his left shoulder. After being blessed with a girl child, their second, Akshay decided to get his daughter’s name “Nitara” inked on his right shoulder. Akshay hasn’t ever gone on to display this tattoo in public.